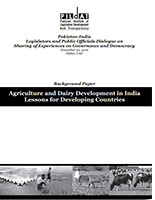 Agriculture and Dairy Development in India Lessons for Developing Countriesis a Background Paper authored by Mr. Vijay Sardana, PGDM (IIMA), M.Sc. (Food Tech.) (CFTRI), B.Sc. (Dairy Tech. )PG Dipl. in Int’l Trade Laws & ADR (ILI), Justice (Harvard)Specialized in Bio-economy & Agribusiness Value Chains, Innovation Management & Capacity Building, for the benefit of participants of the Pakistan-India Legislators and Public Officials Dialogue on Sharing of Experiences on Governance and Democracy scheduled to take place on November 20, 2016 in Dubai, UAE. This author talks of the current situation of the Agriculture, Livestock and Dairy Development Sector in India and the major issues it has faced over the years. The author tries to identify the initiatives taken by the Indian Government and the limitations it has encountered during the process. The author in his analysis outlines the turning points in both sectors and the challenges Haryana and Punjab have faced over the years. Additionally, he also identifies the solutions to combat the current issues being faced by those concerned in the sector.